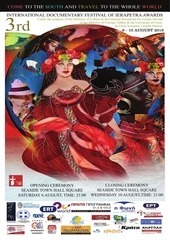 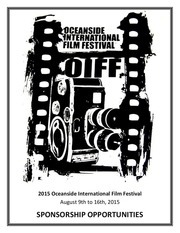 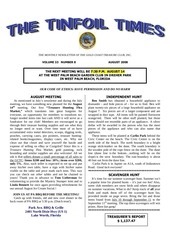 August 2010 Newsletter THE MONTHLY NEWSLETTER OF THE GOLD COAST TREASURE CLUB, INC.
Τhe International Documentary Festival of Ierapetra Awards, already in its 3rd edition, will be held in Ierapetra between 6-10 August. 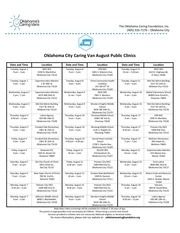 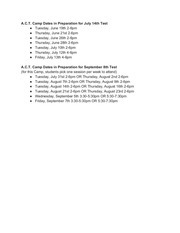 OKC Public Clinic Calendar August (1) The Oklahoma Caring Foundation, Inc.
2014 08 Terminübersicht Terminübersicht August 2014 Evangelische Kirchengemeinde Düren Pfarrbezirk Kreuzau/Nideggen Gemeinde Bezirk Kreuzau-Nideggen Terminübersicht 03. 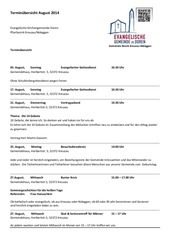 August 2015 in Gelsenkirchen - z. 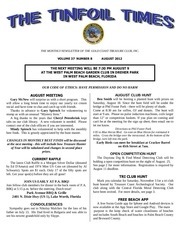 2018 August GCTC Newsletter August, 2018 Volume 43 Number 8 President Frank Nash 786-269-5744 Vice-President Sue Chonoles 561-262-8621 Treasurer Laurie Haire 954-593-4800 Refreshments Frank Nash The Tinfoil Times Gold Coast Treasure Club, Inc.
GBU Mountain News LXXII August 31, 2014 GBU Mountain News GBU Mountain News August 31, 2014 - LXXII _______________________________________________________________________________________________________________________________________ independent - unbiased – professional August 31, 2014 – LXXII 6.0 South Napa Earthquake - What area is next? 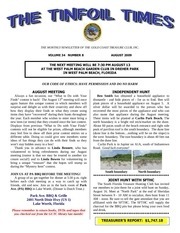 2009 August THE MONTHLY NEWSLETTER OF THE GOLD COAST TREASURE CLUB, INC.
2011 August THE MONTHLY NEWSLETTER OF THE GOLD COAST TREASURE CLUB, INC.
Declutter your living space with these 5 easy tricks Rainforest Italy Tuesday, August 1, 2017 Declutter your living space with these 5 easy tricks Rainforest Italy Tuesday, August 1, 2017 Rainforest Italy Tuesday, August 1, 2017 If laziness stops you from decluttering your house and giving it a new shape we suggest you use a little creativity. 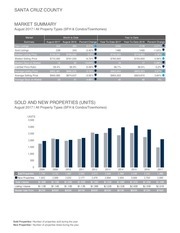 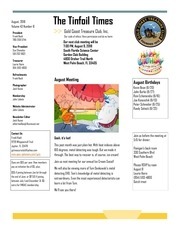 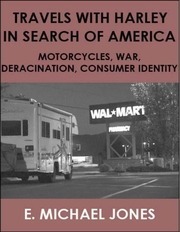 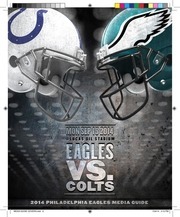 2012 August THE MONTHLY NEWSLETTER OF THE GOLD COAST TREASURE CLUB, INC. 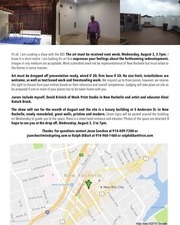 The art must be received next week, Wednesday, August 3, 3-7pm. 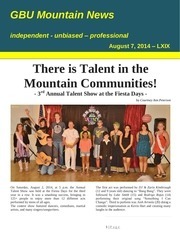 GBU Mountain News LXIX August 7, 2014 GBU Mountain News GBU Mountain News August 7, 2014 - LXIX _______________________________________________________________________________________________________________________________________ independent - unbiased – professional August 7, 2014 – LXIX There is Talent in the Mountain Communities! 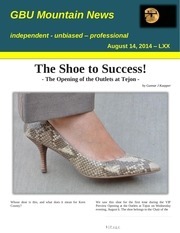 GBU Mountain News LXX August 13, 2014 GBU Mountain News GBU Mountain News August 14, 2014 - LXX _______________________________________________________________________________________________________________________________________ independent - unbiased – professional August 14, 2014 – LXX The Shoe to Success! 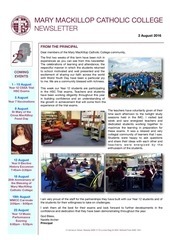 Newsletter 9 2nd August 2016 (1) MARY MACKILLOP CATHOLIC COLLEGE NEWSLETTER 2 August 2016 FROM THE PRINCIPAL Dear members of the Mary MacKillop Catholic College community, COMING EVENTS 1 - 15 August Year 12 CSSA Trial HSC Exams 5 August Year 7 Vaccinations 8 August The first two weeks of this term have been rich in experiences as you can see from this newsletter. 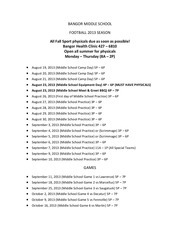 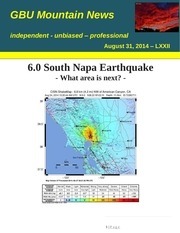 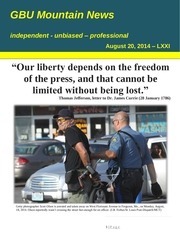 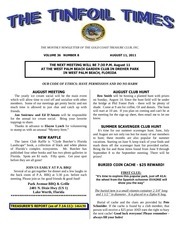 2008 August THE MONTHLY NEWSLETTER OF THE GOLD COAST TREASURE CLUB, INC .
GBU Mountain News LXXI August 20, 2014 GBU Mountain News GBU Mountain News August 20, 2014 - LXXI _______________________________________________________________________________________________________________________________________ independent - unbiased – professional August 20, 2014 – LXXI “Our liberty depends on the freedom of the press, and that cannot be limited without being lost.” Thomas Jefferson, letter to Dr.